Centrality is ASEAN purpose and principle since its establishment in 1967. Later on, centrality is mandated within the ASEAN Charter. 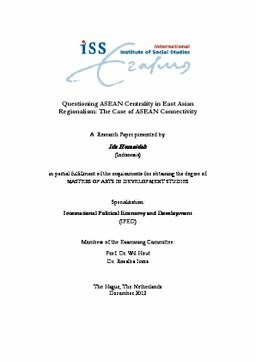 This paper assesses ASEAN Connectivity contribution to ASEAN centrality that argues as one of the instrument to maintain ASEAN centrality. Two International Relations theories, namely Neorealism and Constructivism, and network analysis are used in this paper. The result of the analysis is the same, that is ASEAN centrality is in betweeness centrality with brokerage political advantage. The result could be different if ASEAN has a clear definition on centrality and ASEAN Connectivity is completed.